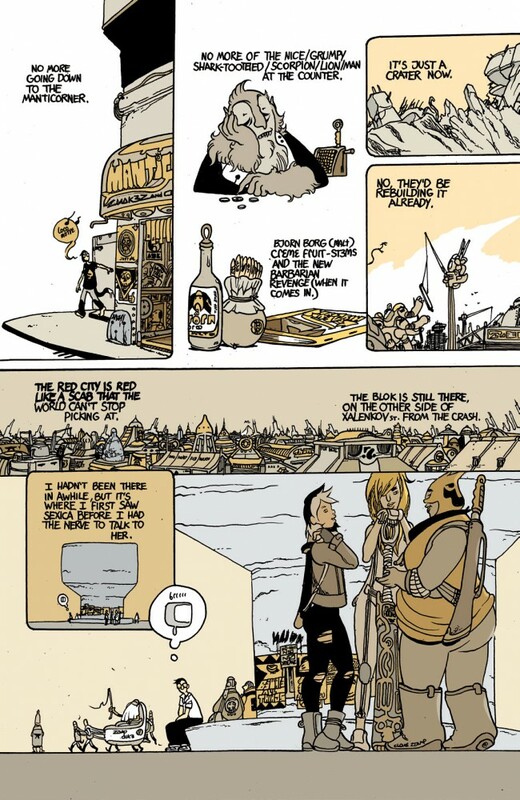 With an ambitious and stylish mix of short and long-form work, editors Brandon Graham and Emma Ríos bring the monthly anthology comic to a new dimension. When Image Expo blasts out its announcements, it’s sometimes hard to pick out the signal in the noise. 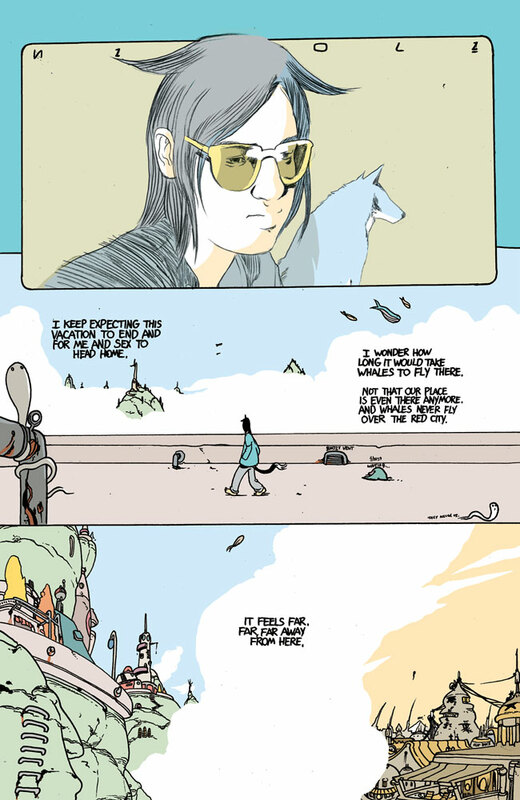 However, the one title that has probably had me most excited since its announcement is Island, an magazine-sized monthly anthology edited by Brandon Graham (Prophet, Multiple Warheads) and Emma Ríos (Pretty Deadly). Amid the A-list creative team-ups and high concepts, Island offered something different: an anthology title that would require a degree of faith from both creators and readers: its creators would have to hope that readers would take the plunge on a diverse mix of material not moulded around a single property or concept, while readers would hope that its creative clique would be subjected to sufficient editorial rigour to keep scheduling and quality consistent. So does the opening issue repay that faith? 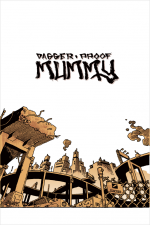 As stated at its introduction, it’s built around three lengthy chapters of ongoing serials. 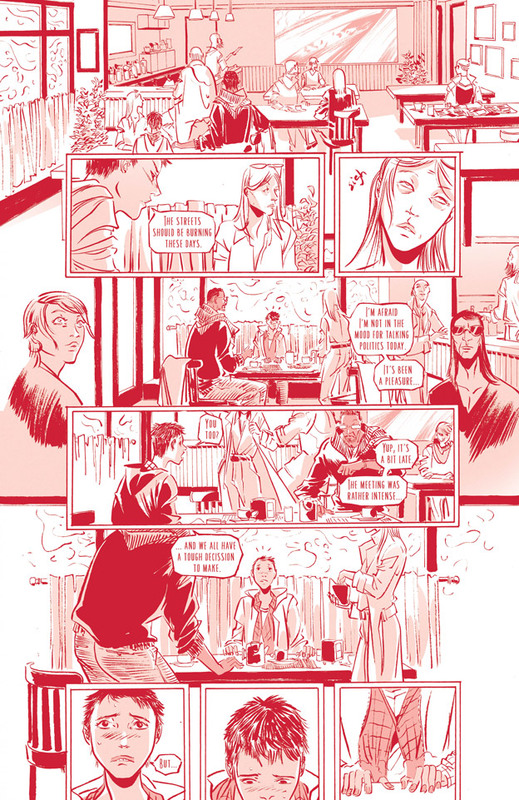 The first of these is the strongest – the 30-page first chapter of ID, written and drawn by Emma Ríos. 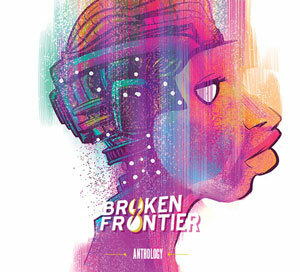 In a near-future setting, it focuses on three people who are unhappy with their physicality and are considering some form of radical makeover (the true nature of which is revealed at the end of the chapter). Meanwhile, the simmering backdrop of political unrest moves gradually into the foreground and envelops the three. 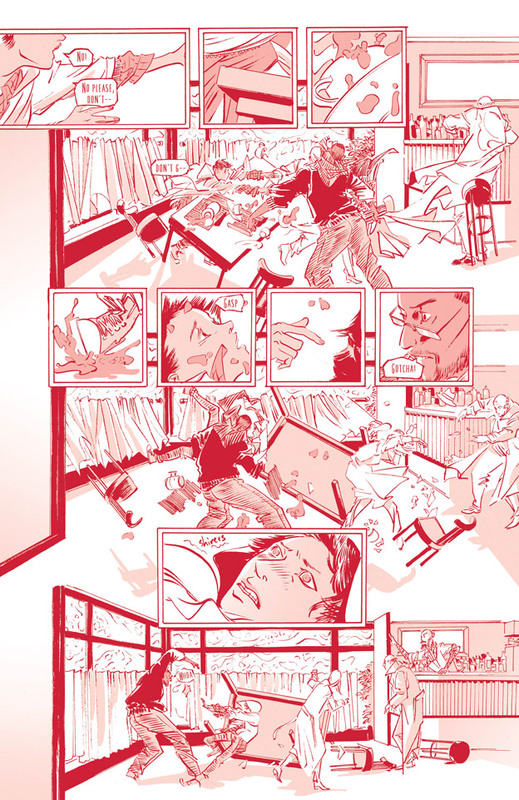 The most striking creative choice here is the decision to present the whole story in a vibrant, even slightly alarming red, which certainly forces the reader to concentrate during some of the busier action panels. However, the biggest surprise – to me, at least – was the skill and economy of Ríos’s writing. In a series centred on notions of identity and self-perception, all we’re given is what the characters choose to reveal about themselves – which is refreshingly little. What is less surprising is the quality of Ríos’s art, which is as brushy and expressive as you’d expect, while effortlessly making the transition from the bleak mythic landscapes of Pretty Deadly to this crowded metropolis. As, in effect, an ‘opening issue’, this is a piece of work that would stand solidly on its own. The next dollop-o-comics comes from the project’s co-originator, Brandon Graham, who pops up with a 30-page return to the wibbly-wobbly world of Multiple Warheads. If you’ve read MW before, you’ll know what to expect. 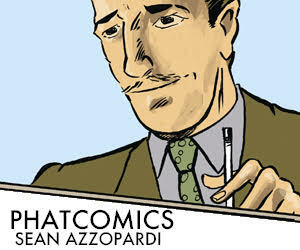 If not, you’re in for a very particular kind of comics experience. If you want a bit of plot blurb, we see part-time werewolf Nikolai wake from a vivid dream to bid a fond farewell to girlfriend Sexica, as she heads off on another smuggling gig. However, as he kicks his heels around the city, he finds himself pulled into an adventure of his own. 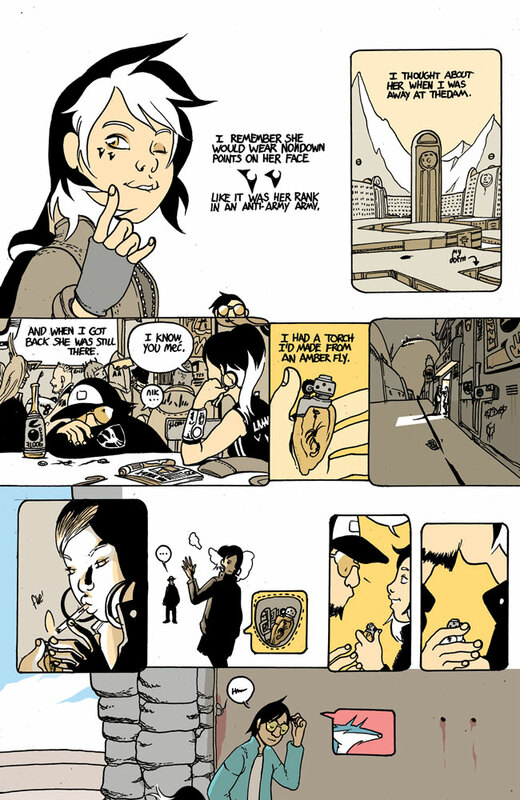 But, of course, the story beats are only a tiny part of the Multiple Warheads experience; the real joy of it is the trippy, jazzy sense of improvisation that infuses just about every page. With its profusion of accretive detail, this is one piece of work that’s perfectly suited to the larger format. As you’d expect, Brandon layers his work with details, throwaway ideas and a barrage of visual and verbal puns. 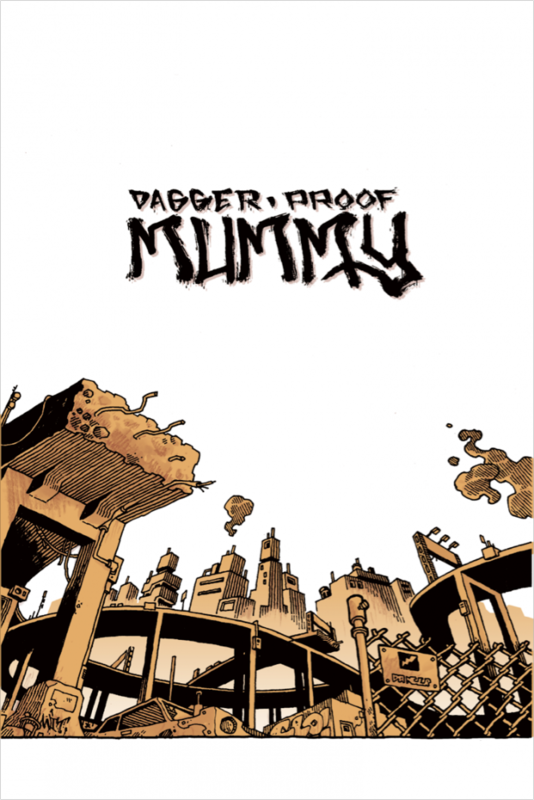 After ID and Multiple Warheads, the final major comic here – the opening part of Dagger-Proof Mummy by the mysterious Ludroe (44 pages) – comes as a bit of a juddering gear change. 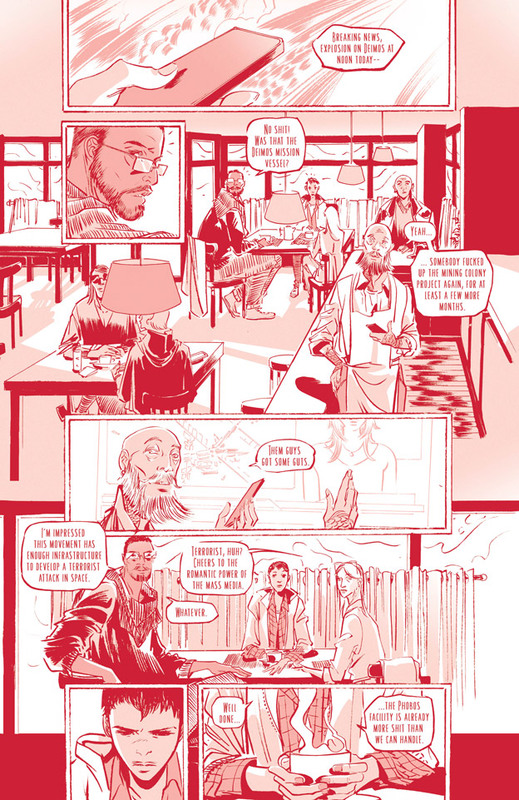 From the density of Ríos and Graham’s pages, you’re suddenly in a much more stripped-down narrative that sometimes seems to be running away too quickly. 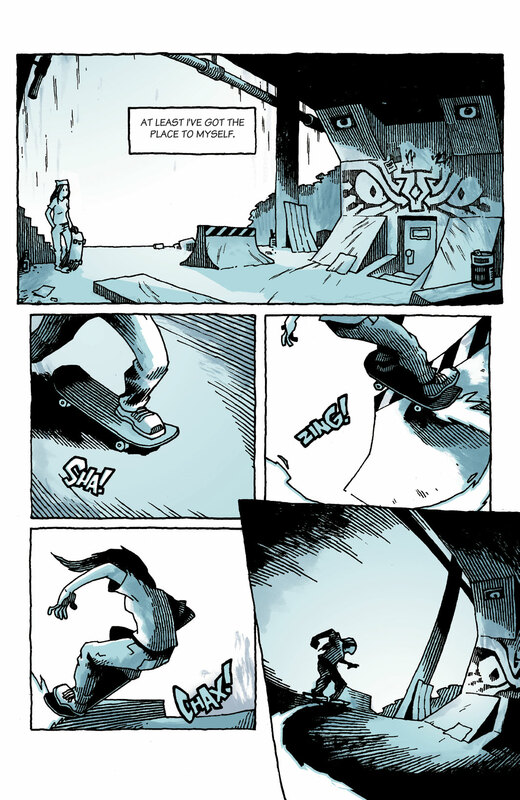 Less engrossing than ID and less engaging than Multiple Warheads, the work is a slightly strange generic mash-up, focusing on a young skateboarder puzzled by the disappearance of her friend/mentor while pulling off a legendary stunt. However, she’s also menaced by a grim gaggle of anthropomorphic ‘hoodie cats’ – cueing up the intervention of the mysterious, bandage-bound title character. Ludroe uses chunky graffiti-style graphics to build his urban environment of broken concrete and chain-link fences, while also using fine shading to create rich textures (as well as another effectively restricted colour palette). 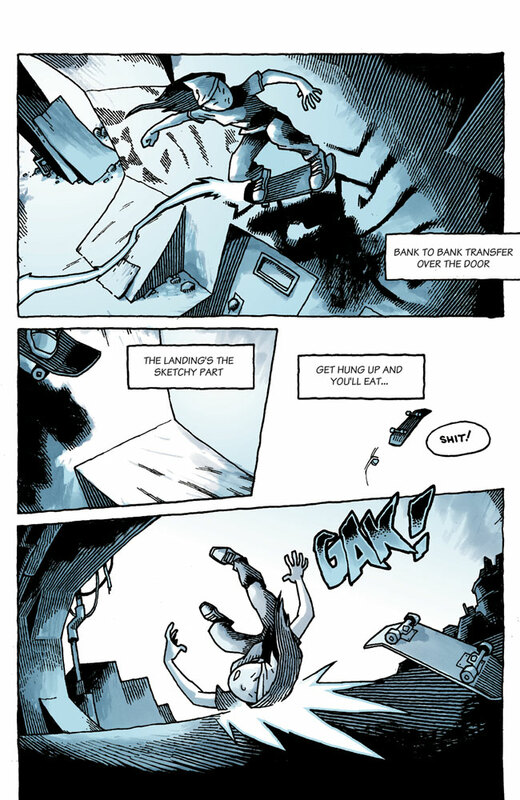 Then, when things get moving, he introduces appropriate manga styling to create strong dynamic panels. Of course, there’s more to Island than that: Kelly Sue DeConnick also provides an intimate and moving prose memoir of an old friend and fellow writer, Maggie Estep, with illustrations from Emma Ríos; Brandon Graham provides an illuminating little two-pager on how he approaches his somewhat idiosyncratic work; and Graham’s partner-in-crime Marian Churchland provides some strong abstract-but-suggestive-of-seascape paintings for the introductory pages. 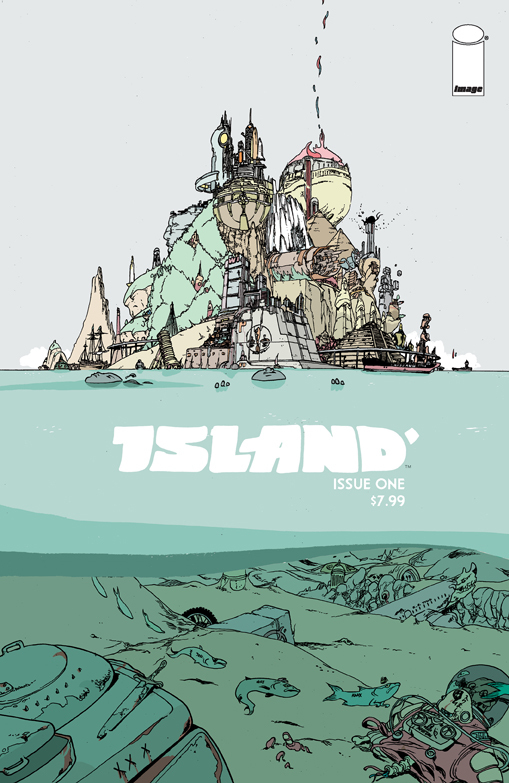 Although Island was announced months ago, its release seems indicative of something in the air, coinciding with the announcement that Grant Morrison will be acting as editor-in-chief at what may become a rejuvenated Heavy Metal – another anthology title that has traditionally drawn readers through a perceived attitude and brand identity rather than the individual line-ups of the issues. A few punters might baulk a little at adding a $7.99 monthly to their pull-list, but if you crack out your abacus and tot up the penny-per-page ratio, you get a figure that probably compares well with most of those other books that you have cluttering up the place (even allowing for the usual caveat regarding anthologies). In a pleasing format and with a strong bench of creators ready to step up, Island is an experiment that deserves at least the chance to succeed.